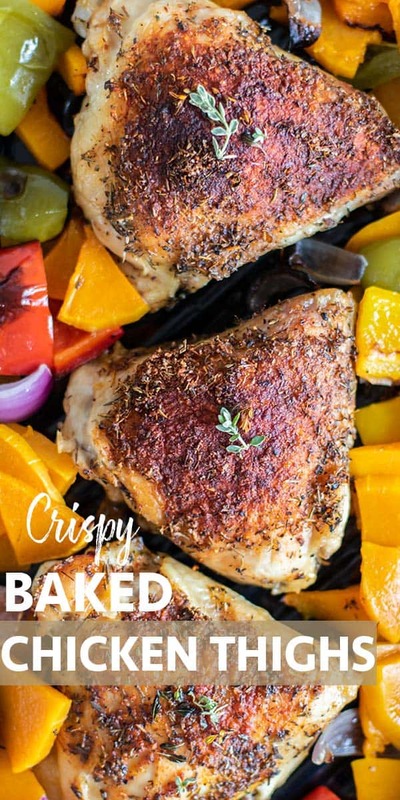 Crispy baked chicken thighs are easy to make with a few tips and tricks! Easy and economical, this meal is one your whole family will enjoy. 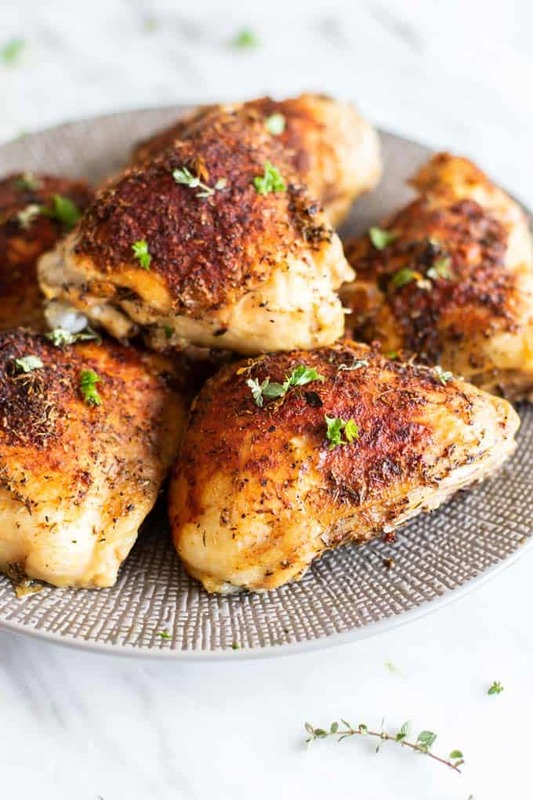 This simple chicken thigh recipe is gluten free and Whole30! Baking chicken pieces until they are crisp on the outside and moist and full of flavor on the inside is easy to do! Use A LOT of spices. The spices create a bit of a coating helping the skin get extra crispy. We want the flavor in the chicken, so a lot is necessary! Dry the chicken pieces with a paper towel prior to drizzling them with olive oil and adding the spices. Bake them a bit lower in temperature and a big longer than you would other chicken recipes. This allows the skin to dry out and crisp, but the meat inside will stay tender and juicy. 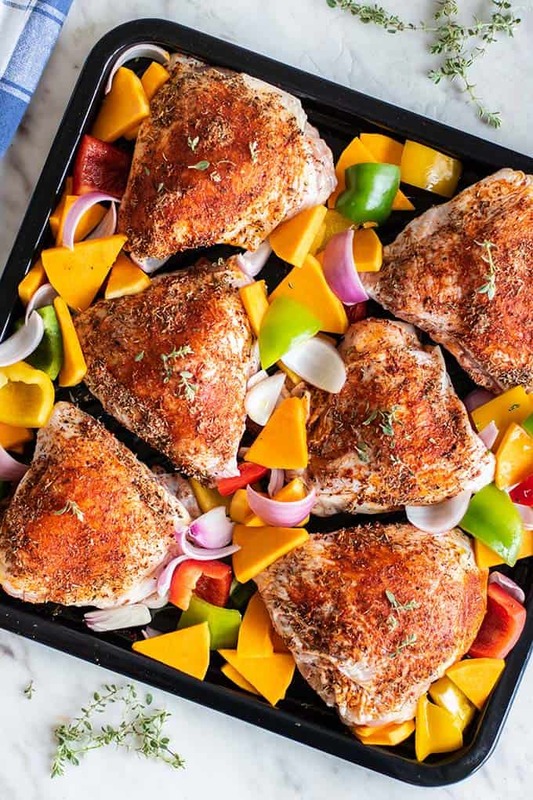 Once your chicken thighs are coated in spices, it’s time to add them to a baking tray with A LOT of veggies, right? Because if you’re going to be baking your chicken, you might as well throw in your veggies and make it a complete meal. Simple dinner recipes are the ones we come back to again and again — when something only takes 15 minutes to prepare, and then you can let your oven do the rest of the work, that’s a recipe you want to hold on to. To make this even easier, I baked this recipe in my Superheated Steam Countertop Oven. This handy oven needs no preheating (instant on! ), and uses a combination of convection and superheated steam to bake and brown, but also keep food moist and juicy on the inside. It’s absolutely perfect for fish and chicken, meats that tend to dry out in the oven if you’re not diligent. If you’re like me, and your attention is scattered between tons of tasks and family members around dinner time, you’ll appreciate the precision of the oven. You can set it and rest assured that everything will be cooked to perfection when the timer goes off. I really appreciate the simplicity of sheet pan dinners. Throw lots of veggies onto your baking sheet, and dinner is set! A sheet pan dinner that's as delicious as it is healthy. 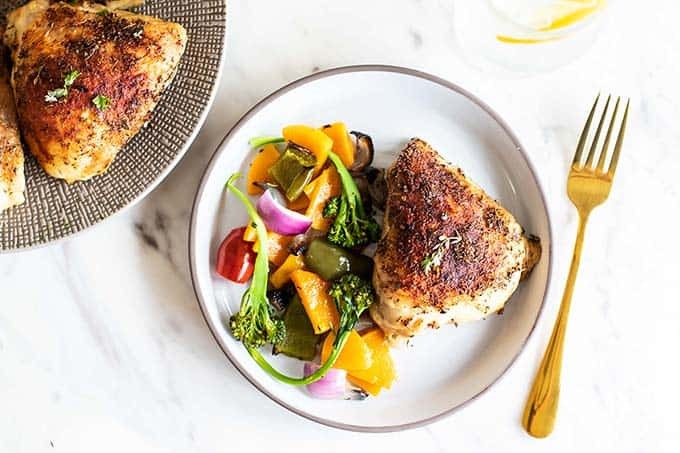 Chicken thighs are coated in spices and baked until crispy on top with a medley of vegetables. 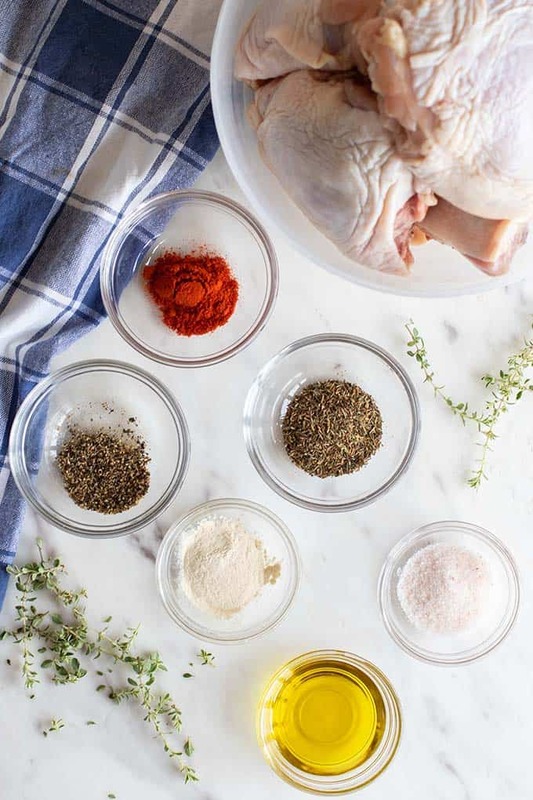 Combine all the spices and salt for the chicken together in a small dish. Prepare chicken thighs by adding them to a baking tray, and using a paper towel to dry them. Drizzle the chicken thighs with olive oil, and then coat them in the seasoning blend. Use hands to rub the spice blend to evenly coat them. 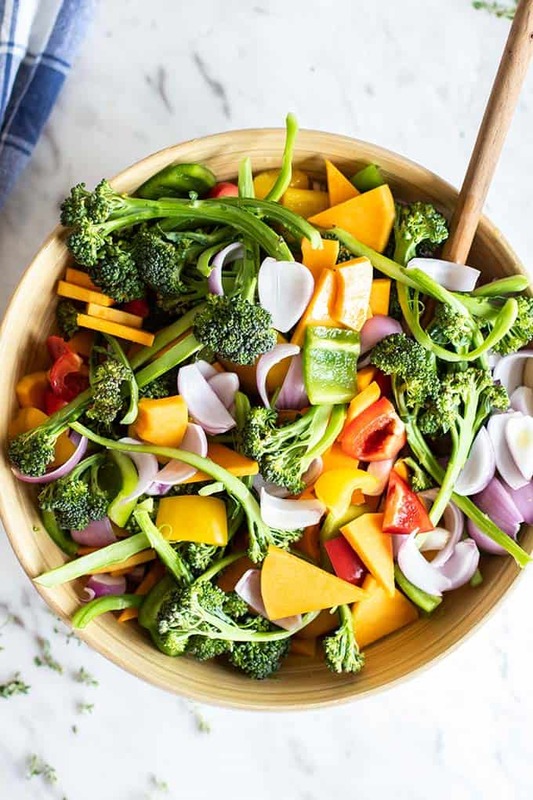 Add all vegetables together in a large bowl, and drizzle them with olive oil. Season to taste with salt and pepper. 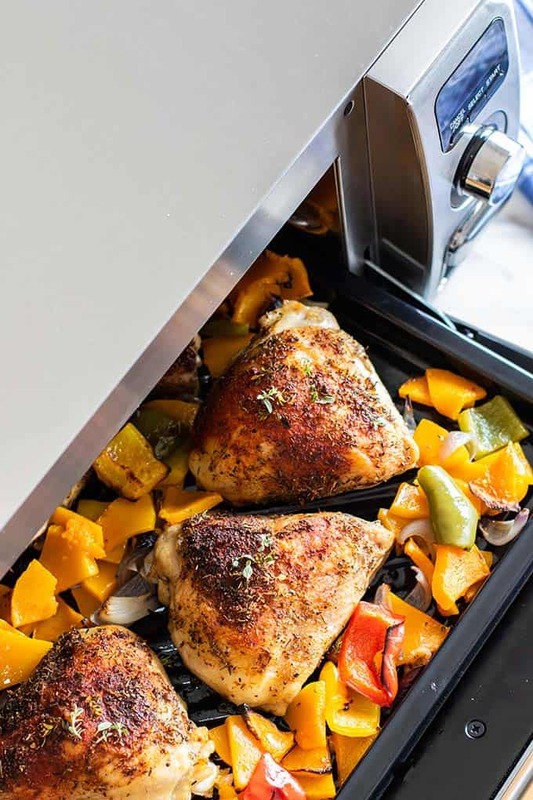 In the Sharp Superheated Steam Countertop Oven, Set the oven to the Broil/Grill setting, and bake at for 30 minutes. Reduce baking time to 25 minutes if there are no vegetables on the tray. 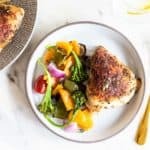 In a conventional oven, preheat the oven to 435ºF, and bake the chicken thighs and vegetables for 40-45 minutes, until crispy and brown on top and the vegetables are well roasted. This Baked Chicken Thighs post may contain affiliate links, meaning if you make a purchase, I will receive part of the sale as a commission. This helps me continue to bring you lots of fresh and inspired recipes! This recipe was over the top delicious! I did make it in a conventional oven but it still came out crispy and moist. I love sheet pan dinners when all the prep is done ahead of time and there's little left to clean up when the meal is over. Thanks for the great recipe that I will be making again and again. I love how easy this is to make! A new favorite meal for weeknights! These look delicious, and I love the combination of spices you have used! What a great meal for an easy weeknight meal, can't wait to try it! Oooh, these look perfectly crispy! Great for serving with a summer salad. All the spices thats gone into making this baked chicken thighs sounds lovely... Great for Potluck!